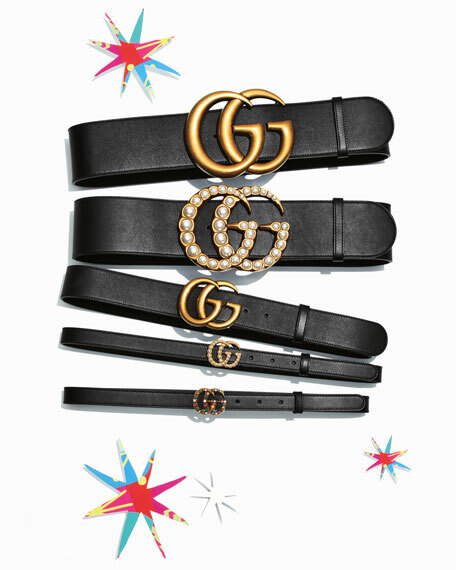 Gucci thin leather belt with golden interlocking-G buckle. Adjustable push-through buckle with leashed keeper. Gucci Sylvie Web belt with leather details. Antiqued brass double G buckle. Approx. 1.5"W. Made in Italy. Gucci "Dionysus" belt in leather. Double tiger head buckle with crystal details. Antiqued silvertone hardware. Made in Italy. Gucci "Moon" belt in genuine calfskin leather. Textured torchon double-G buckle and keeper. Golden hardware. 1.5"W. Made in Italy. Gucci belt with green/red/green Web elastic band. Textured torchon double-G buckle. Golden hardware. Adjustable slider. 1.5"W. Polyester/spandex. Made in Italy.